Private Ryan’s mother is pictured at the threshold of her farmhouse where seconds before all was normal, safe, routine. You see her silhouetted against a bright, beautiful day as the military vehicle pulls up her driveway. When she goes out that door, her world will be radically changed. Recall how Dorothy is enticed out her front door by the brilliance of Munchkinland. The backlit front door scene is a device Steven often uses when a character is lured from safety into vulnerability. See Close Encounters, Sugarland Express, Lincoln, (1941). The little French girl the platoon saves in the first decimated town is wearing red shoes evoking Dorothy’s powerful footwear. Their magic does indeed protect her from the sniper who kills the man rescuing her. Ahhhh… I have been waiting a long time for a reference to ruby slippers, haven’t you? “I gotta get home. I gotta get home right now,” says the wrong Private Ryan after being told his brothers are dead. This is precisely Dorothy’s reaction when Professor Marvel tells her Aunty Em might be ill.
Rather than a personification of a ‘rascal’ like WOO’s Wizard, Tom Hanks’ mission itself is the trickster. While it seems ill-conceived, the ending resonates with the underlying nobility of the cause. See Empire of the Sun, The Color Purple, Lincoln, Munich, A.I., Always, Goonies, Jaws, Catch Me if You Can. Schindler’s List, The Goonies, Used Cars, Joe vs. the Volcano for more tricksters. “I wanna go home. I wanna go home. Mama.” are T-4 Medic Wade’s last words. ‘Home’ is often synonymous with re-uniting children and mothers. See Empire of the Sun, A.I., Sugarland Express, Hook, Saving Private Ryan, War of the Worlds, Close Encounters, Catch me if You Can, The Color Purple, Poltergeist, Jurassic Park (to Grampa) and WOO (to Auntie Em). “Every man I kill, the farther away from home I feel.” Capt. Miller’s remark foreshadows he is not going to get his happy ending. 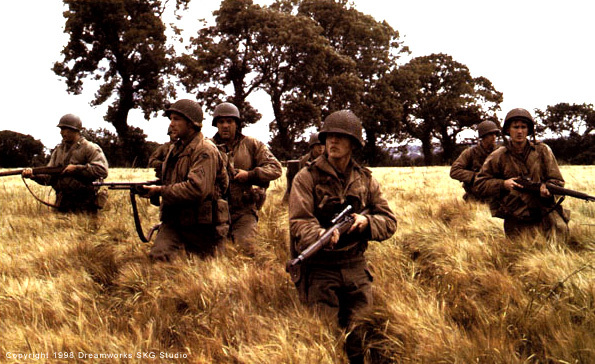 The platoon crosses a field of yellow wildflowers (concealing a hidden danger) right before they reach their goal—the village where Private Ryan is stationed. Dorothy and her friends cross the field of poppies (deadly) before reaching Emerald City and their goal to meet Wizard. None of the protagonists in either movie will find the relief they desire at the haven they worked so hard to reach. Way more battles have yet to be fought. See The Lost World of Jurassic Park, Always, The Color Purple, Twister for other examples of fields and plot turning points. When Tom Hanks goes deaf from the bomb explosion on the beach, and again at the end when they blow up the tank, all the crazy danger and trauma of preceding scenes is eerily minimized by silence and replaced with a moment of transitory peacefulness. This is like when Dorothy’s house drops out of funnel into Munchkinland and the inhabitants are all hiding. Quiet inside. Quiet outside. Illusory safety or at least a moment of respite for hero from action! See Lincoln, E.T., the Extraterrestrial, Jaws, Minority Report, War of the Worlds, Twilight Zone the Movie, Kick the Can Episode. for other ‘silence before the storm’ moments that serve to rebuild tension, after a lot of action. Many directors don’t seem to perceive that too much action is just as boring as not enough. Fetching this young man home to Mother and safety is the whole plot in this film. See WOO, See Jaws, War Horse, The Terminal, A.I., The Color Purple, Sugarland Express, Close Encounters, Empire of the Sun, Catch Me if You Can, War of the Worlds, Super 8, 1941, Amistad, Minority Report, Munich, Hook, Poltergeist, E. T. , Used Cars The Goonies turn this concept inside out, trying to insure their home stays safe. Actually I can make a case for some theme relating to ‘home’ popping up in every movie where Spielberg has exercised a significant personal investment. Perhaps a treatment of leaving or returning home it is one of his criteria for getting involved with a project.